Want to learn more? Make sure to check out Budget Earth'sPeachSkinSheets Review here! (it also includes cute dog pictures!) Would you like the chance to try these awesome sheets out for yourself? 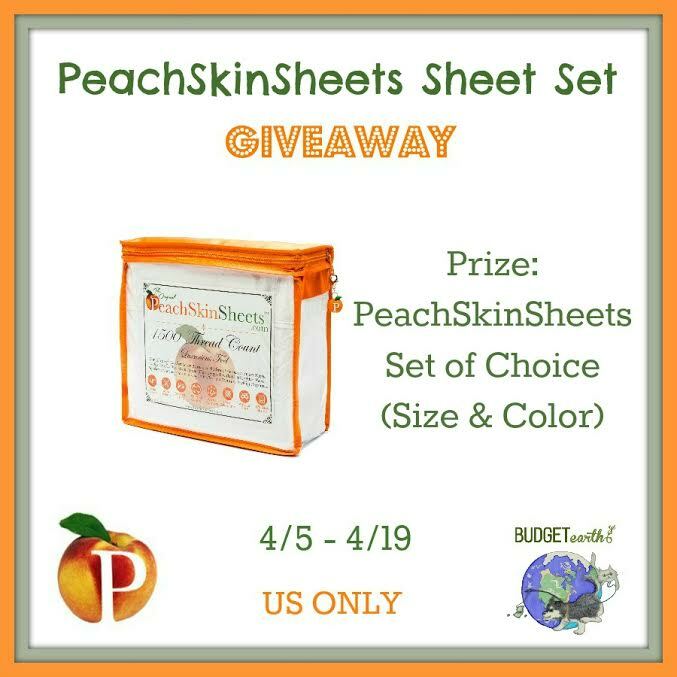 Budget Earth and some of their favorite bloggers are excited to be working with PeachSkinSheets on this fantastic giveaway! 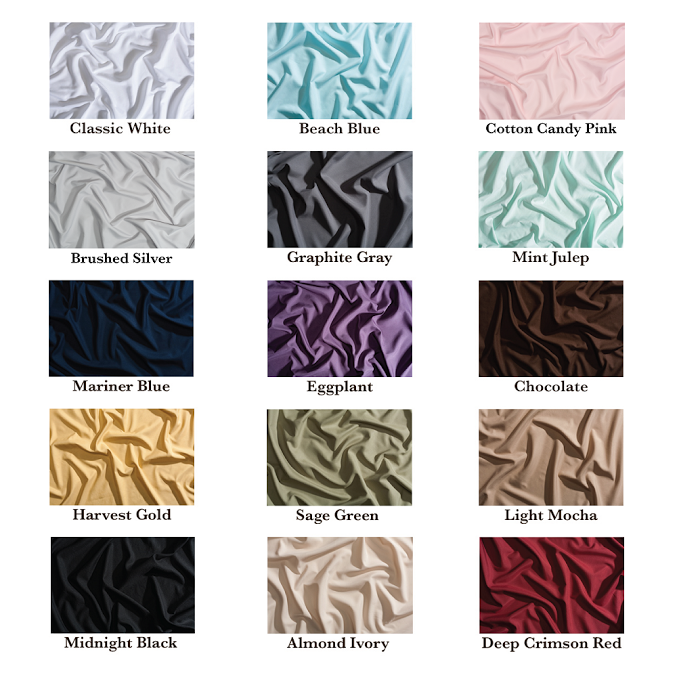 One very lucky reader will win a PeachSkinSheets sheet set in their choice of size and color. To enter, make sure to read the rules below and then enter through the Rafflecopter! Sweepstakes ends April 19 at 11:59pm ET. My husband and I would enjoy these sheets if I won. If I won these wonderful sheet for be for me to enjoy. We would enjoy the new sheets and need some new ones. My hubby and I would be enjoying these. My husband and I would really enjoy these sheets! I would love these for my daughter for a wedding gift. I would be enjoying these. My husband and I would enjoy these sheets if we won. Thanks so much. My husband and I would be enjoying these if I win. I would definitely be using these sheets if I won! I would be enjoying these sheets all on my own if I should win. I will enjoy and share these sheets with a special friend. These sheets will be for my husband and I to enjoy. I will be enjoying these sheets, If I win! I would use them on my bed. I would be enjoying these sheets if I won. I would love some new sheets..its something that would be very cool. My husband and I would use these sheets. I will! My husband too! Nothing like new sheets. They will be going on my bed for sure! Wow!! so many color to pick from. Thanks for the chance. I would be using these sheets myself!! I would be the one that would be enjoying these sheets. My husband & I will enjoy these sheets. Would love to win them. My hubby and I will enjoy the eggplant ones! It would be me, my hubby, our youngest daughter and our dog since we all sleep in the same bed. thank you! That would be me enjoying those beautiful sheets! And I love the colors too. My husband and I would use them! My husband and I would enjoy these sheets. I would love to get these for our master bedroom! My husband & I would enjoy these sheets. I will be enjoying these. The sheets would be for me & my husband. The wife and I will be enjoying these and maybe the pups, if their lucky. My daughter would love to be enjoying these sheets. My husband, little puppy, and I will love them!! I would be enjoying these...and my dog would be sneaking in too! I would love to win these for my parents. I love love love to cuddle with my sweet rescue doggy, Stormy! Oh, I could really use new sheets. I have three rescued Treeing Walker Coonhounds who share my bed. They really can dirty up my sheets, but even worse, my girl, Kyoko, likes to "dig" at the sheet. She recently ripped one sheet and previously even tore my mattress pad. These sheets sound wonderful. I do wish they had a shade of blue between the two they have, but I think I'd have to go with the dark blue since it wouldn't show the muddy paw prints from the dogs. They do go outside just before we go to bed. my husband and i will be enjoying these sheets if i won, we would love them. I'd win them for my bed! My daughter would really like these sheets. Thanks! My husband and I would be enjoying these sheets. We are way over-due for a new set. My husband and I would enjoy these sheets if I win. I am always looking for comfy sheets and these sound great. I would use these sheets on my bed! I will be the one enjoying these sheets. I got a sample of the fabric in the mail and these are amazing! Thanks for the giveaway. My husband and I would enjoy them!! My husband and I would be enjoying this sheets. If I win these sheets my husband and I will be enjoying them in the master bedroom! That would definitely be me as well! I WILL BE ENJOYING THESE SHEETS IF I WIN !!!! I would be loving these! Thanks so much for the chances to win. They would be going on my bed, thank you for the chance to win. I would be using them. I would be enjoying these sheets if I win. My husband and I would be the ones enjoying these sheets if I won. Fortunately for my husband and myself, we are it...so we will enjoy them. p.s. this is a great giveaway! I would put these sheets on our bed in our bedroom. My daughter needs sheets for her new bed! yes indeed, these would be for me! my indulgence! I'd get these for my parents! They're needing a new set. Thanks! My boyfriend and I will be enjoying the beautiful sheets! I would use these sheets! I haven't had new sheets in a long time! My wife & I would enjoy sleeping on a PeachSkinSheets Sheet Set !!! The sheets would be for me! I would love to have some new sheets for my boyfriend and I! I would be enjoying these sheets but since my son likes to steal my bed I guess he would be too.